The Harvil Hydraulic Rowing Machine is a compact rower designed to offer the same fitness benefits of rowing without the need for a large floorspace. Unlike most rowers, this brightly colored rowing machine offers folding arms that provide a full rowing range of motion, similar to the feel of actually rowing with oars. It also comes with a steel frame, sliding seat, and budget asking price. But the important question is- can you get a real workout with the Harvil rower? Rowing machines come in 4 different varieties, named for the type of resistance they provide: hydraulic, magnetic, air, and water. As the name implies, hydraulic rowers use 1 or 2 hydraulic pumps to provide the resistance that you row against. The name sounds kind of fancy, but it’s actually a pretty simple system. It consists of a tube with a piston inside it. As you pull the handles, the piston moves through the tube which has air and or oil in it. The piston meets resistance as it moves through this tube. Some hydraulic rowers let you adjust the tension of the tube, increasing or decreasing the resistance you feel. Others don’t give you this luxury. Since these hydraulic systems are pretty simple, these rowers usually don’t cost much. They also don’t take up much space, especially when compared to a full size rower that can be around 8 feet long. Their smaller size also means they usually have lower weight capacities, so they usually aren’t appropriate for larger or taller individuals. Harvil is a budget brand owned exclusively by Dazadi, a family-owned company that provides budget gear with an emphasis on great customer service. Their hydraulic rowing machine comes well reviewed by users who appreciate its sturdy feel and compact size. That sturdy feel is the result of its steel construction. Compact, yet sturdy, this small rower has a max weight capacity of 250 lb. This is on the low side when compared to full size magnetic and air rowers where you might see a 500 lb weight limit (like the famous Concept2 Model D), but for a hydraulic rower it’s respectable. The Harvil rower is great for apartments and small homes because of its compact size: 50″ (L) x 36″ (W) x 20″(H). It can easily be stored flat under beds or placed vertically when not in use (it only weighs about 34 lb too, so moving shouldn’t be an issue). Not all hydraulic rowers have adjustable resistance, but the Harvil rower does. It has a knob on the hydraulic piston that you can turn to increase or decrease the resistance you feel while you row. This is a nice touch, because it gives you workout variety. It also ensures that it can keep up with you as you get stronger. The Harvil Hydraulic Rower has a single piston by the way. Rowers with 2 pistons are usually capable of offering a little more resistance than a single piston system. With time and experience, you will get better at rowing. You’ll be able to row longer at higher resistances. Hydraulic rowers that don’t have adjustable resistance can’t grow with you. Not to mention the boredom that is likely to occur. Having the ability to increase the resistance as needed is a perk for such an affordable machine. The arms on this rowing machine are a little different than the handles you pull on a full size rower. The wider angle gives you the opportunity to row with a more circular pattern if you like. This gives the feel of rowing with oars on a canoe. If you don’t want the extra range of motion, you don’t have to use it. You can also keep your hands in closer as you pull and return to your starting position. When not in use, the arms fold in towards the frame, saving space and ensuring they don’t get caught up on anyone walking by. This also makes the machine a little more compact, which is nice when every inch counts. Harvil likes to claim this rower has a contoured seat for extra comfort. All seats are contoured, so that doesn’t mean a lot. This seat isn’t any less comfortably than any other rowing machine. The fact is, they are all pretty uncomfortable if you ask me. The important feature here is that the seat does slide. Not all hydraulic rowers have sliding seats. Having the sliding seat is going to make your rowing experience feel more comfortable, more like a club rower. It’s also going to work your legs better and help you burn more calories over all. The foot straps are where most users complain. There’s no getting around it, they stink. They are flimsy and the straps aren’t very effective in keeping your feet stationary. You can adjust the strap to fit in one of two positions, but neither seems to work that well. You will probably have to wear a pair of sneakers with a good grippy bottom to secure your feet more securely. The Harvil Hydraulic Rower comes with a small, LCD monitor. Nothing fancy here, but it will help you track a few metrics and keep time. The monitor displays: time, row count, and calories. It also has a scan feature to shift through them. The display isn’t large, but it’s big enough to see clearly during use. At this price point, a warranty isn’t guaranteed. However, Harvil does offer a 180 day warranty on this rower. This is a very short warranty and obviously can’t compare to the warranties provided on higher-end rowers, but for this price we shouldn’t expect much in the warranty department. Anything is better than nothing. 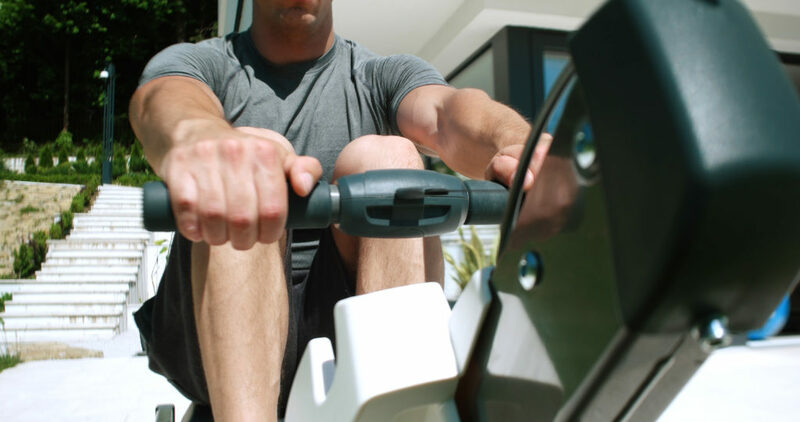 The Harvil Hydraulic Rowing Machine is a budget rower designed for small spaces. It’s easy to assemble and does come with a warranty, although it’s very short. The adjustable resistance is a nice touch we don’t always see on rowing machines in this price range, as is the sliding seat. The biggest complaint users have about this rower are the foot straps- they don’t work very well. Some folks are more comfortable simply placing their feet on the ground as they row, others are able to jerry-rig a more secure fit by changing their shoes or using additional straps. For the price, it’s well built and feels sturdier than it probably has any right to. Users seem to agree the resistance it provides is sufficient enough to get a solid cardio workout in. So to answer my question- yes, the Harvil Rower can provide a real workout. That is, if you fit the size requirements of this machine. This rower is obviously designed for smaller people with its size and weight limit, so if you are big and tall, sorry. I also wouldn’t recommend this to serious rowers, it just won’t hold up. Overall though, I think the Harvil Rowing Machine is a pretty good buy if you are on a really tight budget or need a compact rower for a small workout area.